Congratulations—you're ready to approach life in a whole new way with movement at the center. New research is turning old thinking on its head. Moving more is not just about formal exercise. It's about turning to a new way of life to counter the effects of a sedentary lifestyle. Start a healthy activity program through your community group or church. Working out with friends, sharing healthy exercise tips, and inviting guest speakers can change the entire culture toward healthy living and more movement. Spend all the time you want being outdoors, as it helps you to become more energized, upbeat, and fit. Not to mention, it also increases your movement. At work, walk and stand more. Instead of email, walk to see your colleagues. Stand while talking on the phone. Use every excuse to get up, walk, and move. Set an alarm and never sit for more than 30 minutes. Take the next step beyond diet and exercise to embracing wholeness of body, soul, and mind. Positive lifestyle changes are always possible even at an older age, but a long-term view is necessary. Sliding between multiple stages in any given week is perfectly normal. 1. If you feel pain in your knees, you should get off your feet until the pain goes away. 2. Joint pain is caused by arthritis, and you should just learn to live with it. 3. It's possible to overcome joint pain by walking just 30 minutes per day. 4. Being only 10 lbs. overweight can add 30-60 lbs. of pressure on your knees. 5. Men have heart attacks more often than women. 6. The Vicious Cycle that starts with joint pain can be broken through movement. 7. Drinking 5-10 glasses of water each day can help with weight loss. 8. Depression can make knee pain worse and vice versa. 9. Diabetes is a common side effect of not moving. 10. No matter your age, you can break the Vicious Cycle. Now you know the importance of movement. If you would like to go back and follow choice A, please click here. 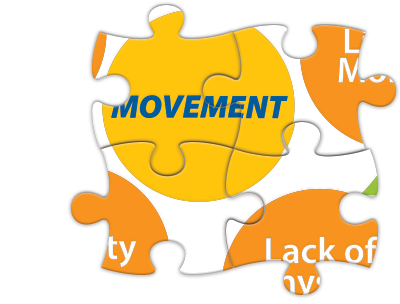 Don't forget to tell your friends about movementislifejourney.com … and come back again and again to refresh your memory, solve the puzzle and break the Vicious Cycle. The "Start Moving Start Living" community is for people who want to see positive results in the form of increased activity, greater mobility, less chronic pain and start moving towards better health. Millions of Americans experience limited mobility due to joint pain, that often leads to being overweight or obese, diabetes, heart disease, depression and other related health issues. The good news is that you can break the cycle of pain and weight gain by "Start Moving". Join with people like you who want to learn how to start moving, keep moving, and improve your health. Welcome! Click here to Join!